This section looks at the toy packaging, organised by series, including all variations available to us. Different colour variations for each toy have also been included inasmuch as (pictures of) these are available to us, and in a few cases show variations not included in the toy section. All 15 smaller vehicles could also be bought together with a vacuformed moonscape in Spacex Superset 1, sold at 55/-, which actually wasn't that good a deal. (2) The number 1 in that set name might imply the existence of a Superset 2 (which could for example also include the larger toys), but there is no evidence to suggest this may have existed. 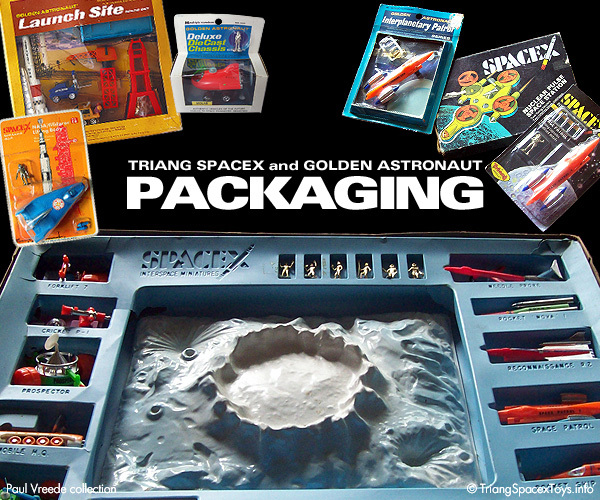 A further three boxed sets became available later (price unknown unfortunately), each containing one large toy and five to six smaller toys as well as a paper play surface, respectively called the Earth Launch Pad Set, Space Station Set and Moon Base Set. Whereas Superset 1 contains early coloured versions of the toys, the later three sets can also contain late-colour vehicles. Superset 1 with its sizeable box was still being promoted in early 1970, when the three newer sets will also have become available to still contain early colour versions. Even though the three new sets still look very roomy depending on the contents, their boxes were roughly half the size of Superset 1 and will have been rather cheaper to transport. The blister cards all share the same basic image as a background to the toys. 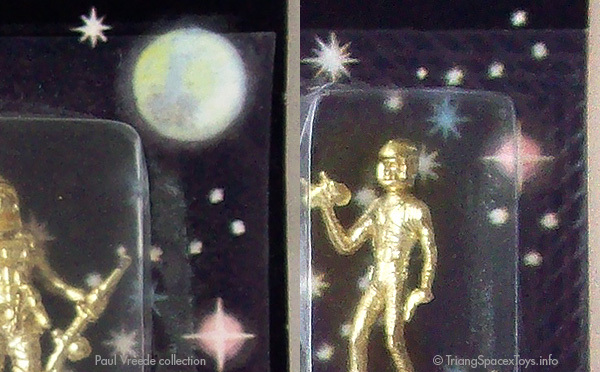 Name and details for each individual toy have been reversed out of the black background, which saved printing costs through only having to change the printing plates for the black to continue printing cards from one vehicle to the next. Not so the card backs, each of which showed four different vehicles from the range and thus needed all four printing plates to be changed to start printing cards for another vehicle. From the various duplicate cards I have, it's clear specific card backs are always matched to specific card fronts - this ensures that the four vehicles pictured on the back didn't include the vehicle on the card. Next to what is a really nice and strong logo, the rest of the typography on Spacex cards is a bit of an all-sorts of fonts, unfortunately, where in some cases the toys on the cards were placed right on top of their name and details. On the back there's a small blooper as well: the description "Models of authentic designs created by scientists" was slightly mistranslated in the Italian, Dutch, Swedish and French versions to read "Authentic models created by space scientists" - the German text describes the toys as "True-to-original reproductions of spacecraft" though omits the scientists. What is more amazing is that the Dutch text mentions these craft are for "reaching the moon and exploring the depths of the oceans"! Interestingly, a number of the vehicles shown on the card backs feature unusual colours and details. Those in non-production colours I think are "test shots", where plastic in odd colours was used to test the moulding dies and check component fit. The few vehicles showing detail differences must be prototypes of some sort. There is one (deliberate) variation in the artwork on Spacex cards: a large white star with the model number was added to the printing, while the other smaller stars were added as sharp linework instead of taken over from the original painted background illustration. The haloes round the Earth and other stars have also been reduced or removed in prepress by extending the background black. Because relatively few surviving cards have a numbered star and all starred cards contain late-colour toys, I believe this change must have been introduced shortly before production ceased in 1971. The colour of the moon (and Earth) can appear in any shade from grey to pale blue to vivid blue with reddish and greenish accents. All of these different shades were obtained from the same artwork, and are the result of (very) inconsistent ink densities while printing between one batch of backing cards and another. The edges of the plastic blisters are usually smooth, but can also show a waffle pattern of either squares or diamond shapes. Because both early and later toys have survived on cards with or without a waffled blister edge, these blisters must have been shaped on different machines, quite possibly by different subcontractors. As will be apparent further on in this section, a number of cards also received a differently-shaped blister, where it appears the more compact layouts were replaced with a more spread-out version. The sleeve boxes for the three larger Lipkin-produced toys have some beautiful graphics on them. Lovely line art illustrations, in a very 60s style (especially the yellow and green moon!). Apart from the fact that they put the Dutch flag upside-down above each contents description, this box art is by far my favourite. In contrast, the illustrations on Spacex Superset 1 really have me wondering. Is this the best they could get? And appropriate to a gift box that cost a pretty penny as well? The mind boggles. Thankfully the later three boxed sets used photographs instead of this (let's call it) quaint style of illustration. 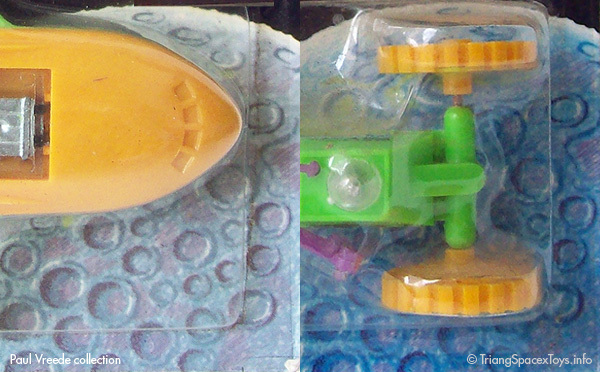 The three larger toys were combined with two smaller vehicles each, to make up three boxed sets. These were also colour-coded for three of the themed series, and had a suggested retail price of $3 apiece. 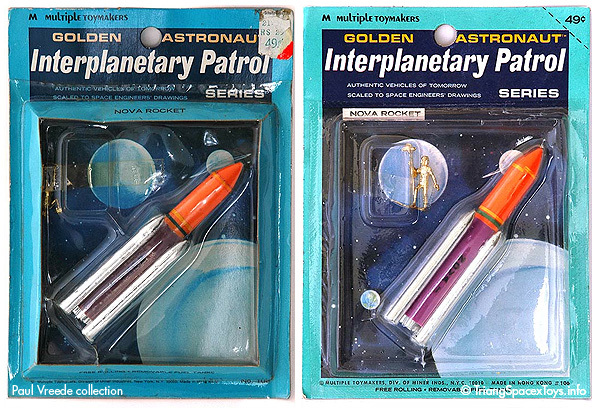 As an extra addition to the range (it's not included in any GA advertising I've seen), there was a GA Super Set similar in scope and contents to the Spacex equivalent. However, through having a somewhat smaller moonscape and a much more compact layout, the GA Super Set box is only 2/3 the size of the Spacex version, making it somewhat cheaper to produce and transport. 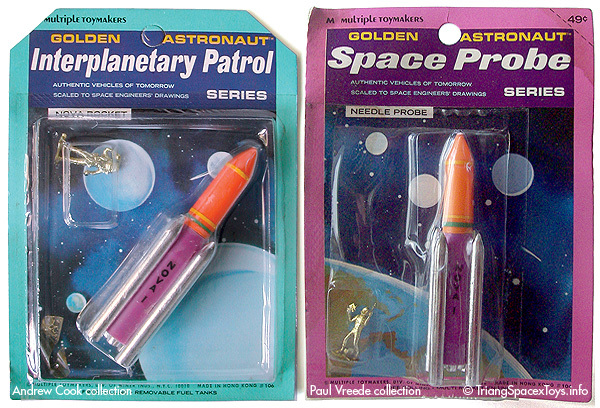 Judging by two early-version toys included in my example, the GA Super Set must have been available right from the introduction of the range. And thankfully the GA Super Set box top benefits from a much better standard of illustration than the (rather unskilled) style used for its Spacex counterpart. We sadly don't know how much it cost. In graphic terms, the GA cards look more balanced and have more coherent typography than their Spacex equivalents, even though they don't have that beautiful logo. Initially, GA cards (singles and triples) had an inner card frame inside the blister (shown at left in picture below). This allowed the printing of the single cards to be identical for each themed series (front and back), because vehicle names and details were printed on this inner frame. Which incidentally had the consequence that the different vehicles in each themed series all carried the same stock number on the card. One small variation at this stage is the presence or not of a pre-printed price on the card, where I have a few cards without it (including some that have a price sticker for the same 49¢ on them). I'm assuming the cards without price are the earliest, since all later cards do carry it. Maybe the frame was still costly, for it was dropped after awhile (shown above at right). Which resulted in vehicle names and details now being printed on the card itself (in black only), and a few of the blisters being changed in layout to some degree (as illustrated above by the toys sitting at different angles). Before the frame was omitted, the colour coding on the card had already been slightly changed for two of the themed series (I have a card with both card edge and frame in the revised colour). As can be seen on the examples elsewhere in this section, the Space Probe colour lost the mauvish tint to its pink colour, while the light blue for the Interplanetary Patrol theme was replaced by a more aqua pale blue. Inconsistent ink densities used when printing different batches could also make the Interplanetary Patrol colour appear more green than blue. At least one shipment of later cards had both corners cut in such a neat and uniform way (shown above left) that we suspect it was done at the factory to eliminate the SRP of 49¢ (5). The reason why we can only guess at (eliminating the price because of rising plastic costs due to the oil crisis has been suggested, but the first oil crisis hit in 1973, well after production of Spacex toys ceased). 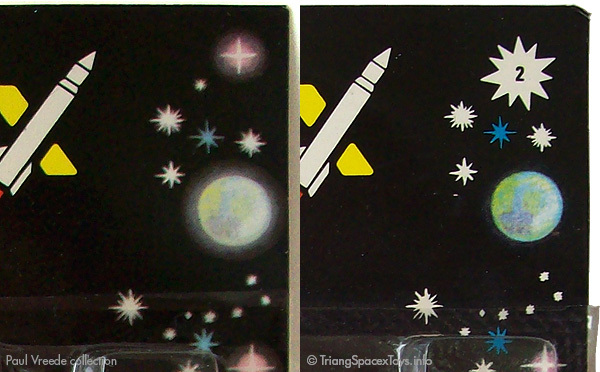 A final variation (shown above right) consists of GA cards being fitted with the blisters from Spacex cards. As well as the card itself being mismatched with the toy in quite a few cases. Although this combination could conceivably be a stopgap measure coupled with a few mistaken mismatches, I think it's more plausible that these cards stem from the very end of production, after Triang went bankrupt. Such a scenario would see the McArthur factory in Hong Kong making use of any remaining stocks to still deliver as many packaged toys as possible to Multiple Toymakers, thus getting paid for toys that would otherwise become surplus. The relatively few triple cards that survive all have an inner frame, including one that contains a late-version Security Copter with short secondary rotor blades. This would suggest triple cards did indeed keep the inner frame right up to the end of production in 1971. The three themed boxed sets carried on the GA graphic style, with the toys visible through the box lid window, neatly laid out on the illustrated inner tray. However, the GA Super Set featured an illustration on its lid, much like its Spacex cousin. When Pippin extended the Spacex range, they also introduced a new style of card. Probably taking their cues from the GA designs, the card fronts now had a new, colour coded background illustration for each themed series. The very attractive illustrations on the card backs are not unlike those on the Lipkin-produced sleeve boxes, and also carry a colour coded frame to indicate which themed series each vehicle belongs to. The additional larger toys were sold in boxes which also carried new graphics. We only have two of these, which show that the new graphic style wasn't consistently carried over, although the colour coded frames are present and the painted illustrations are of much better quality. The new cards for the Pippin extensions to the fleet carried a new numbering system on the blister cards, where each of the new toys is identified by a letter+number code indicating the themed series and it's place in that. E1 being the first vehicle in the Earth Launch theme, M standing for Moon Base and S for Space Exploration. The confusing thing is that for the Spacex II range, the same numbers were used again, meaning there are two different toys identified as S1 and S2 etc. The four new vehicles that reached the States received attractive new window boxes, stating this was the GA Deluxe Diecast Chassis Series. These boxes are identical for the four toys (and again carry the same stock number), the name of each vehicle appearing on a little yellow tag visible inside the window. As a final note, we so far haven't discovered any price details for the later series of toys. As a final note, all Spacex and GA cards (and boxes) were printed on single-coated card, having a glossy side for the front of the cards, and a rougher, matt surface for the back. This difference is visible here and there because the two surfaces can age differently, with the back discolouring (far) more than the front. This site and all its contents © Paul Vreede 2007-2016 unless specified otherwise.